Madras girls basketball crushes Corbett, loses to No. 3-ranked North Marion Huskies. The Madras Lady Buffs were able to dominate the Corbett Cardinals 75-40 Wednesday but lost 60-41 to the No. 3-ranked North Marion Huskies Friday in an important game for the Tri-Valley Conference. On Wednesday, the Cardinals scored the first points of the game, but sophomore Jayden Davis then scored 8 points in a row for the Buffs, who took an 8-4 lead. A few plays later, Davis knocked down a 3-pointer and Monika Stacona hit a pair of free throws, putting Madras up by 10. Vanessa Culps and Jalaney Suppah both scored, but the 12-0 Madras run was stopped by an Isabelle VanHee basket. 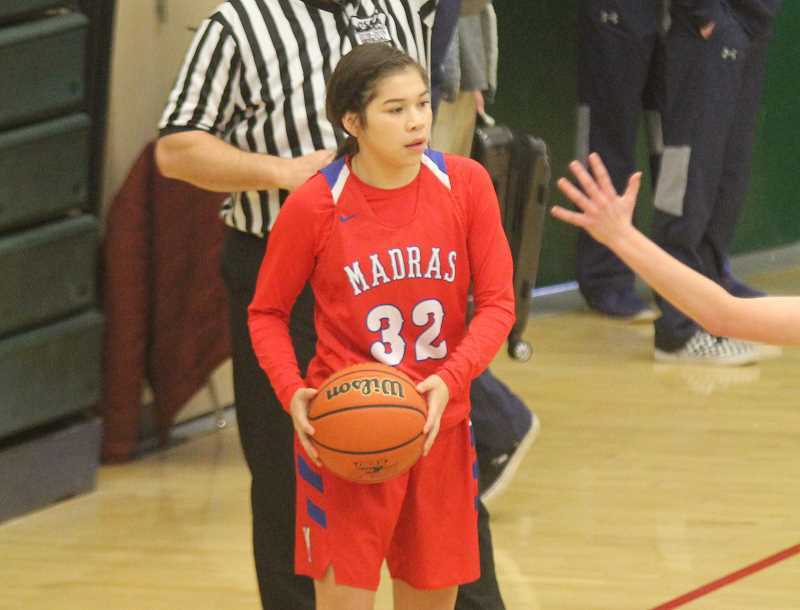 Jackie Zamora-Heath and Niya Bagley were both able to score near the end of the quarter for Madras. Corbett hit a three at the end of the first and the Buffs entered the second quarter up 24-11. Bagley and Davis both scored for the Lady Buffs to start off the second period, and a few plays later Dominique Walker buried back-to-back 3-pointers to put Madras up by 23 points. The route was on. The Lady Buffs outscored Corbett 18-10 in the second quarter and took a 42-21 lead at the end of the first half. Jiana Smith-Francis and Culps were the first Buffalos to score in the second half of the game as Madras took a 46-22 lead. Another dominant quarter for Madras gave the Buffs a 29-point lead to start the last quarter of their first league game. With a huge lead, the Lady Buffs coasted to the 75-40 win. Madras had several players score over 5 points, in a balanced game for the Lady Buffs. Davis led Madras with 15 points and two assists. Smith-Francis contributed with nine points, three rebounds, and four assists, with Culps adding 8 points and six rebounds. Holliday, Walker, Bagley and Stacona all scored 7 points for the White Buffalos. The No. 3-ranked Huskies scored the first three baskets of the game to take a 6-0 lead before Smith-Francis scored for Madras. A strong start carried onward as North Marion built a 13-2 lead with around two minutes left in the quarter. But the Huskies made the mistake of leaving Madras sharp-shooter Vanessa Culps open from behind the arc. Culps made back-to-back threes and cut the Huskies' lead down to five. When the first quarter came to an end, North Marion had a 15-8 lead. North Marion showed why they are ranked so high, going on a 12-0 run to start the second quarter, holding the Buffs scoreless for the first six minutes of the period. Culps ended the run with another shot from behind the 3-point line. Davis was able to score and Bagley hit a 3-pointer to close the scoring gap to 29-16, in favor of North Marion. The White Buffalos went into halftime down 31-16. The Huskies scored the first 6 points of the second half, but Culps continued her hot shooting night with another made 3-pointer. The Huskies outscored the Buffs 17-9 in the third quarter and took a 19-point lead at the start of the last quarter. Culps hit two more 3-pointers to start off the fourth quarter and the Buffs were able to outscore North Marion in the period. But the deficit was too large, and North Marion too steady, for Madras to threaten. For the night, Culps hit six 3-pointers, scoring 20 points to lead the Lady Buffs, while Davis and Smith-Francis both added 7 points. The Lady Buffs (9-6) travel to Molalla (9-7) Friday, Jan. 25, and have a home game against Estacada (2-14) Tuesday, Jan. 29, with both games starting at 7 p.m.